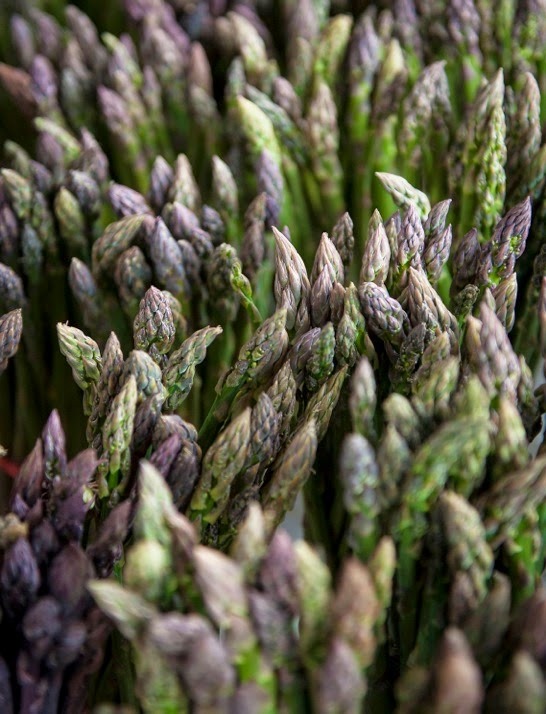 There is a moment, just before the lilacs open, that the early asparagus appear at the farmers market. Tied in bundles these first mauve tipped spears are a delicate confirmation that the spring is finally here. There may still be a crust of snow in the shadiest part of the garden, but there is really no turning back. Asparagus!. Soon as I get home with my bundles, the first batch is boiled quickly until bright green, then served, per my grandmother's instructions, with plenty of melted butter for dipping. She insisted the spears be presented on a white linen napkin, but I'm always too eager for such niceties. I try to resist devouring them standing at the counter, and at least sit down, attentive to their decidedly grassy flavor. As the season progresses, the spears will be fatter, more succulent, to grace every dinner -- grilled and served with lemon and grated Parmesan, sauteed with shallots for a light creamy pasta, or tossed into a faro salad. By mid-June, there will be but a few spears left, some woody and tough. But by then we will have moved along to early tomatoes, raspberries and summer things. When you bring your asparagus home, if you're not going to cook them right away, trim the bottoms of the stalks to stand up in a cup or vase, as you would flowers, and store in the refrigerator. Then, just before cooking, snap the ends off where they are no longer pliable. To blanch, drop the spears into rapidly boiling water and cook until they turn bright green, then drain right away. To sautee, toss them raw into a pan with a little butter, roll, cover and "butter steam" until tender. To grill, place them over indirect heat and roll until just tender and nicely charred. Love the image of placing asparagus in a vase — can't wait to give it a whirl!